Your asphalt driveway is showing signs of wear. Should you fix the areas of concern or replace the entire driveway? Minor problems can usually be fixed. In fact, it’s a good idea to fix them right away before they become major problems. Not every driveway problem is worth repairing, however. Sometimes, replacing your driveway is the more sensible solution. How can you decide whether to repair or replace your asphalt driveway? Start by reviewing the following guide. It will walk you through some of the signs that point toward driveway replacement. If water pools on your driveway, it’s a sign of a drainage problem. Ideally, your driveway will be sloped in a way that accommodates water runoff, or sloped to a dry well if elevations are lacking. Over time, however, pits, ruts and depressions can form, creating spaces for water to gather. Those problems could be the result of structural damage. Standing water can eventually work its way under the top layer of asphalt, especially if there are cracks in the pavement. Water seepage is especially problematic during the winter months, when freezing and thawing can send the water through a cycle of expanding and contracting. Poor drainage can be a sign that you should consider driveway replacement. Not only is standing water often a sign of structural deterioration, but left untreated, pools of water can lead to further pavement problems. 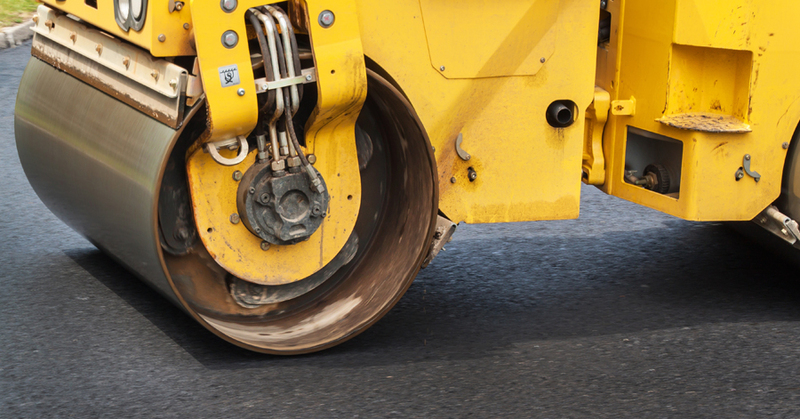 Asphalt is a combination of binder and aggregate. Over time, the aggregate can come loose from the binder. You may notice loose pieces of gravel on the surface, or you may see that your driveway is starting to pit. Addressed right away, raveling is treatable. Ignored, however, the problem can quickly spiral out of control. At first, raveling loosens only fine particles of aggregate, but then larger pieces begin to break away, and the surface becomes rougher. Imagine the pattern on the back of an alligator. It's a good look for reptile skin, but it's not so good for a driveway. When your driveway develops a series of overlapping cracks, they start to divide the pavement into a series of small, broken sections. This problem is known as alligator cracking. Cracks of this nature may be a sign that the subbase under your pavement is no longer supportive. When this lower layer fails, it results in damage to the surface layer. This can serve as an indication that it may be time to take out the old driveway and start fresh with a new subbase and topcoat. Once your driveway has begun to develop alligator cracks, you may want to replace it right away. Sometimes repairs get put off, however, and then the problem can become even more severe. The alligator-cracked pieces may break away from the driveway, leaving behind potholes. You might receive advice to try using cold-mix asphalt to fill the pothole yourself. This may work as a short-term fix that can hold you over until you replace your driveway, but it's not a permanent solution. Cold-mix asphalt cannot fill all the tiny nooks and crannies of the pothole, so water will be able to seep into the cracks. This can cause further damage. Besides, potholes rarely happen independently from additional problems. If you have one pothole, there's a good chance that it's accompanied by another hole, a series of alligator cracks, or some other type of damage. Replacing the driveway may be your best bet. There are two basic types of asphalt cracks that affect residential and commercial driveways. Longitudinal cracks run along the length of the driveway. Transverse cracks run across the driveway. You can see examples of these cracks and a few other types of breaks in the following video. A few longitudinal or transverse cracks are not necessarily an indication that you need to replace the whole driveway. Cracks can generally be paved or filled. However, when you start to get multiple cracks, that’s a sign of a bigger problem. For example, a series of longitudinal cracks can turn into alligator cracks. Breaks along the edge of the driveway can cause crumbling. Plus, many cracks mean that water has many entry points. Experiencing one problem after another is typically a sign that your driveway is no longer in good shape. There may be a fundamental problem with the structure, such as a deteriorated subbase or a worn-out surface, that is contributing to these many failures. There comes a time when trying to repair one problem at a time is no longer sensible or cost-effective. Instead, it makes more sense to start fresh. With that solution, you can address the underlying issues and end up with a finished product that should last you for many more years to come. With proper care, asphalt surfaces can hold up well for years, but even the best ones don’t last forever. Eventually, it is time to retire your old pavement and lay down a fresh surface. Around the 10-15 year mark, you may notice an increase in driveway problems. The surface may be lined with cracks and faded from UV rays. You might see crumbling edges and spots with raveling. Instead of addressing these problems individually, consider that it may be time to replace your asphalt driveway. Some paved surfaces do last for 20 years or more, but if yours is starting to show signs of serious wear after about 10 or 15 years, it makes more sense to start fresh than to limp along with it for another decade. Hopefully, by now, you have a better idea of whether you should repair or replace your asphalt surface. If minor problems are addressed early, a professional team can often provide a satisfactory fix. When major damage or a multitude of problems has arisen, however, it might be time for a replacement. If you still need help deciding what to do, consult a paving professional. An asphalt contractor can evaluate your specific situation and provide expert advice. Give us a call, and our experienced team can help you decide between repairing and replacing.